Don’t ask me, but Dallus Creek’s name is spelled with a “u” and not an “a”. I’ve never seen it done that way, so I suspect someone went to Texas, had a bad time, and came home to “dis” the Texans! 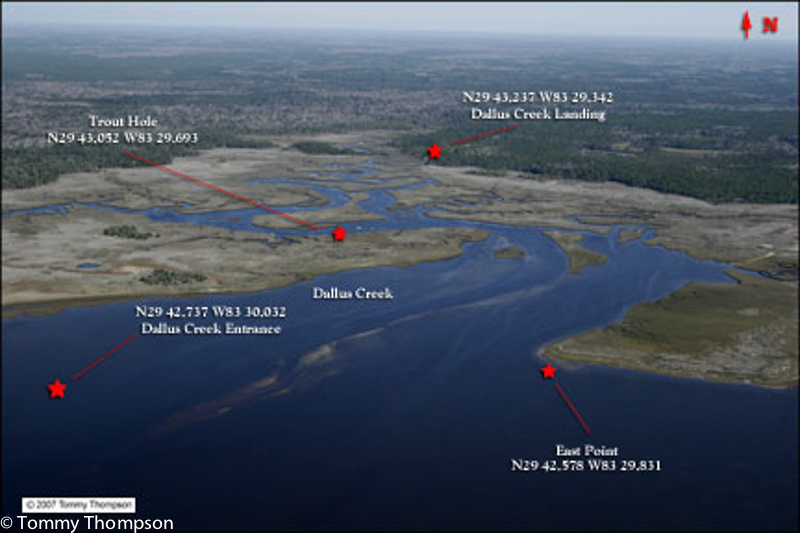 No matter, Dallus Creek is located between Steinhatchee and Keaton Beach, Fl. 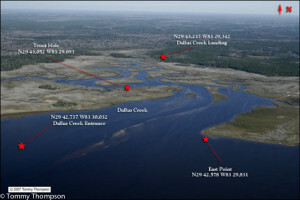 It starts rather unceremoniously near CR361 (the Beach Road along the coastline) and empties into the Gulf of Mexico through several shallow channels. 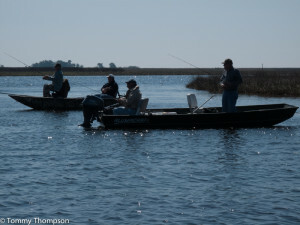 Outside the creek, anglers drift for trout most of the year and inside the creek, they fish for trout and redfish on cold winter days. Aerial view of the Gulf Entrance to Dallus Creek. 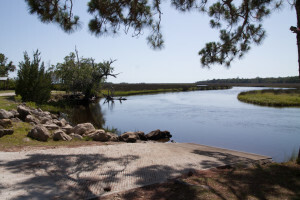 Be careful if you enter the creek from the Gulf, as even the channels can be very shallow on low tide. The Dallus Creek Ramp, located just off CR361. Be careful here, too! There are shallow spots in the upper creek. Entering the creek from here is a task for small boats, paddle craft or airboats. On cool days, you’ll find lots of trout fishermen throwing MirrOlures into the deep holes inside Dallus Creek. On warmer days, they’re on the flats outside the creek mouth.